The Mercedes M-Class has now got a smaller version driving around with it. The GLK is based on the platform of the C-Class compact executive car, it is designed to rival the Audi Q5, the BMW X3 and the Land Rover Freelander. 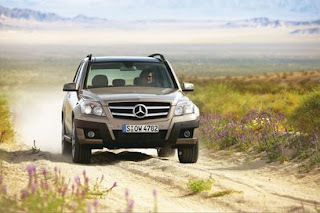 The GLK might be heavier than some of the other models, but it does not lack performance. The base model engine is the 2.1-litre four-cylinder common-rail diesel unit, giving out 170bhp. It gets 0-62 in 8.8seconds and gets a top speed of 127mph. It has a fuel economy of 40.9mpg. The top of the range motor is the diesel 224bhp 3.0-litre V6. There are also 3.0-litre and 3.5-litre V6 petrol engines offering 231bhp and 272bhp. Later on we might even be graced with a V8-powered GLK 63 AMG, or even a hybrid. The buyer can decide which package he wants, the sports package with 19-inch wheels, stiffer suspension and 20mm lower ride height, or theres the option with 17-inch wheels and more ground clearance. All of the models will have the 4Matic all-wheel-drive system and a 7G-Tronic Touch-Shift automatic transmission. Sales in Europe will start in October, but most likely only hit the UK in 2010 because of the four-wheel-drive complications with right hand drive. Price is not yet known, neither is auto-insurance quotes.